Instrumental TRIO or QUARTET available on request, for parties, etc. Bass, solo trumpet or sax / clarinet, drums, plus SCRUMBLY or any VOCALIST on this page. A truly eclectic DADA cabaret / lounge act. 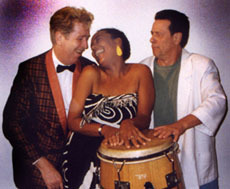 Featuring KIM FOWLER, vocalist extraordinaire, BOB ERNST, well-known Bay Area actor on percussion, vocals, and comic interludes and SCRUMBLY at the keyboard and vocals. Original songs, deconstructed standards, and obscurities from Broadway to Tom Waits. Theatrical show available. 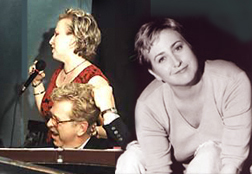 Award winning musical actress CINDY GOLDFIELD teams with SCRUMBLY in this whimsical cabaret act. 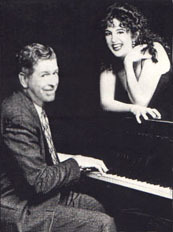 Both recieved the 2000 Dean Goodman Choice Award for cabaret performance in this duo. Songs include Vaudeville / English Music Hall, vintage to contemporary Broadway, obscure standards and obvious discoveries! Theatrical show available. CURRAN REICHERT brings her formidable vocal talent to SCRUMBLY'S arrangements on keyboard and vocal back-ups. After wowing audiences on stages in New York, Washington DC, and San Francisco, the newly-frocked Rev. Reichert still keeps singing her ever-expanding cabaret repertoire. Her extremely beautiful and versatile voice runs the gamut from blues to classical in style. LEIGH CROW, the artist formerly known as ELVIS HERSELVIS, and SCRUMBLY create 60s Vegas-style Lounge ala Steve and Eadie. Goldfinger, Blame It On the Bossa Nova, The Look of Love, Goin' Out of My Head, Luck Be a Lady Tonight......... You get the idea! ARTURO GALSTER AS MARLENE DIETRICH. Arturo, well known underground impersonator does the great movie star to a T! In both English and nearly perfect German, he sings, talks, and recreates the whole stunning persona, in gorgeous costumes! SYLVIE BRAITMAN, French (especially Piaff), Yiddish, classical and standards. an exquisite classically trained mezzo-soprano. BETTE ROI, a native Parisian jazz singer. With SCRUMBLY, she mainly sings the songs of Edith Piaff, Josephine Baker, and Charles Trenet. Bette has a very beautiful expressive voice, similar to the famous Chanteuse, but also well suited to jazz. 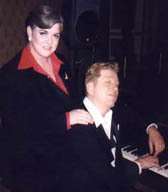 SCRUMBLY also has repertoire with CONNIE CHAMPAIGN (especially as Judy Garland), DARLENE POPOVIC, SHARON McNIGHT and DAVID REIGN.